To the modern bogan’s ancestors, the mention of the word Angus was likely trigger a mental image of a small man dressed as an underage boy, grinding out blues-infused Oz rock. But to the Young Modern bogan, Angus means so much more. Despite often being the beneficiary of a comfortable suburban upbringing, the bogan instinctively knows a lot about agriculture. It knows that lamb is Australia’s finest native animal for eating on Australia Day, it knows that it once joined a facebook group about mountain cattlemen or John Brumby or something, and lately it also knows that Angus beef is the best beef by heaps. Angus Young was developed in Scotland and exported to Australia in order to fleece money from the bogan, and Angus beef has followed an identical path. Longtime bogan sustenance vendors McDonald’s and Hungry Jacks, in partnership with industry lobby group Certified Australian Angus Beef Pty Ltd, have managed to convince the bogan that the breed of a cow is the only thing that influences the taste of beef (with the possible exception of putting flame grill markings on it). While non-biased meat experts will tell you that the age, diet, and condition of a cow is much more relevant to how its meat will taste, the hungry bogan has no time for listening to these ivory tower academic intellectual arseholes. In August 2009, McDonald’s launched two different Angus burgers at a 30% price premium to its standard beef burger fare, and mounted a $10 million advertising campaign informing the bogan that it should purchase something “a little bit fancy” containing 35.7 grams of fat. The bogan, by then accustomed to the fanciness of the plastic sparkling dragon-tiger thing on its Ed Hardy t-shirt, needed little convincing in order to incorporate additional fanciness into its life. A month later, total beef sales at McDonald’s were up by around 20%. Witnessing this impressive new method of creating value in the mind of the bogan, Hungry Jack’s was predictably not far behind. In November 2009, they launched their own Angus range, also at a hefty price premium to the normal range. Don’t let it be said that Hungry Jack’s was merely imitating, because the company incorporated two additional bogan-catnip factors. First was the proven bogan truism that more is always more. In addition to a single patty option there was a double Angus option, so that the bogan could take it to the max. 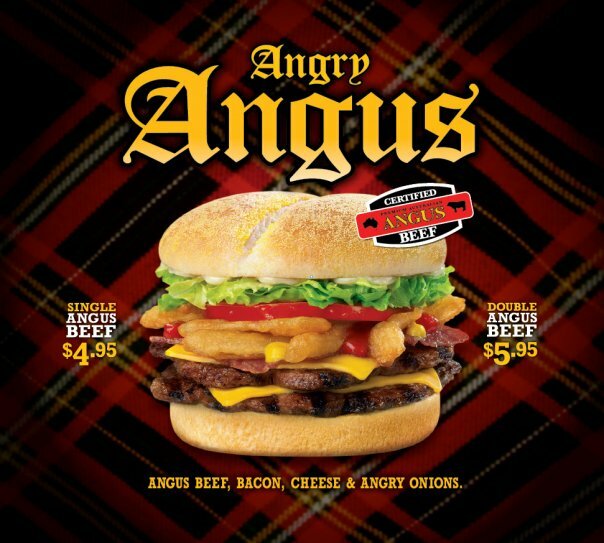 Second, in case the max wasn’t quite max enough, the burger was called the Angry Angus, featuring “angry onions” and 56.5 grams of fat. The bogan loves being angry, and will unflinchingly pay whatever it takes in order to demonstrate its ability to conquer things that also claim to be angry. After the initial flurry for newly-unlocked additional bogan bucks, the burger chains have once again found themselves in an uneasy deadlock with each other. It is understood that Hungry Jack’s is currently employing structural engineers to discover whether they can advance beyond their Quad Stack (71 grams of fat, and available with diet coke) burger of 2008, while McDonald’s is rumoured to be attempting to source a reliable supply of pythons for its forthcoming Snake Oil Max Burger. Angus Beef’s ascendency in the mind of the bogan has been of particular interest to me. After all, Angus is merely a breed, not a grade! they say a fool and his money are quickly seperated, but given the bogan’s dependence on credit, I’d say a fool and the banks money are quickly seperated. Angus Beef is a great example of this! The retardation is relentless !